Austrian manufacturing town, in the province of Moravia. Probably its earliest Jewish settlement dated from the latter half of the fifteenth century, when exiles from Olmütz found a refuge there (1454). Up to the time when the restriction on the freedom of residence of Jews in Austria was removed, Prossnitz was the second largest congregation in Moravia, numbering 328 families (see Familianten Gesetz). The congregation first emerged from obscurity in the beginning of the seventeenth century, when Simḥah ben Gershon Rapoport printed there a collection of Sabbath hymns ("Ḳol Simḥah," 1602). The printing-press, however, did not exist very long, nor did it produce any works of consequence. Of the rabbis who have officiated in Prossnitz the following are known: Gershon Ashkenazi (c. 1650); Meïr Eisenstadt (Ash; c. 1700); Nahum (Nehemias) Trebitsch (until 1830); Löw Schwab (1830-36); Hirsch B. Fassel (1836-53); Adolf Schmiedl (1853-69); Emil Hoff (1870-97); L. Goldschmied (since 1897). During the seventeenth and eighteenth centuries Prossnitz was the center of the Shabbethaian heresy, notably because of the influence of Löbele of Prossnitz. In the first half of the nineteenth century the town became the center of the educational and Reform movement in the province. Löw Schwab was the first German preacher in Moravia, and his successor, Hirsch B. Fassel, worked for the progress of education, the reform of religious services, and the encouragement of manual industry. He also petitioned Emperor Ferdinand in the interest of the political emancipation of the Jews. Through the activity of the Jews Prossnitz has become an industrial center for the manufacture of clothing and calico. The fact that the Jews have always sided with the small German minority of the city's population against the Slavic majority has often produced friction. Prossnitz had many Talmudic scholars. Moses Sofer, who lived there about 1790, conducted a yeshibah; and during the first half of the nineteenth century Moses Katz Wannefried presided over a large yeshibah which numbered Adolf Jellinck among its pupils. Of Jewish scholars and other well-known persons born in Prossnitz, Moritz Steinschneider, Moritz Eisler, Gideon Brecher, and Louis Schnabel of New York may be mentioned. Among the prominent Orthodox rabbis who were natives of Prossnitz were Daniel Prosṭiẓ Steinschneider of Presburg, and Menahem Katz, rabbi of Deutsch-Kreuz, for years the recognized leader of Hungarian Orthodoxy. A number of artists and scholars were born at Prossnitz, as the pianist Brüll. Prossnitz has a synagogue, dedicated in 1904, a bet ha-midrash, founded by Veit Ehrenstamm, and numerous foundations for charitable purposes. The former Jewish school was made a public school in 1868, but is still largely attended by Jewish pupils. 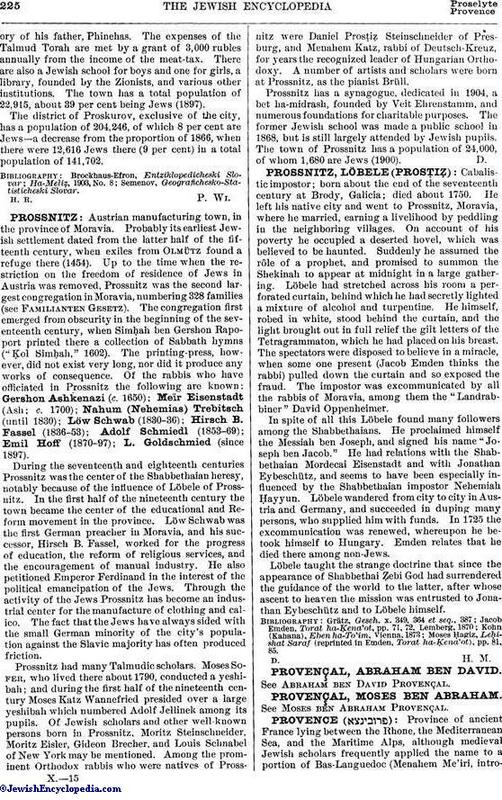 The town of Prossnitz has a population of 24,000, of whom 1,680 are Jews (1900).